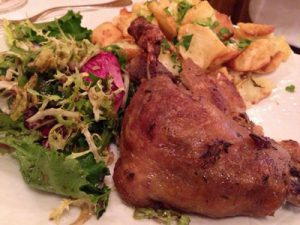 One of the many French staples served at restaurants, bistros and brasseries throughout Paris is confit de canard (duck confit)—a leg of duck that’s salt-cured and then cooked in its own fat. It seems that it’s practically a requirement that every cook in the city makes and sells this dish. But truth be told, most Parisian eateries serve up a very poorly cooked canard. More often than not, you’re served a piece of duck with rubbery skin and super-greasy meat or one that’s so overcooked that it’s harder to choke down than an overdone Thanksgiving turkey. 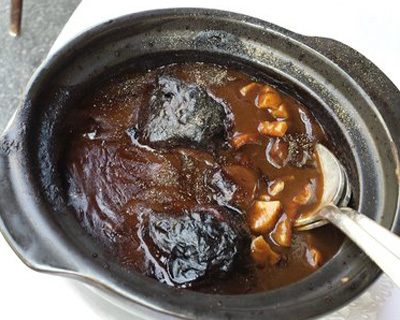 Fortunately, there are a handful of restaurants in Paris that know how to prepare a perfect confit with crisp, crackling skin and moist, succulent meat, and one of the very best is Chez Dumonet in the 6th Arrondissement. 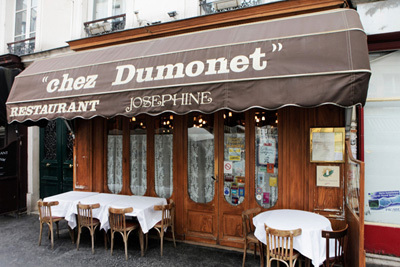 Located just a few blocks from the Montparnasse tower at 17 Rue du Cherche-Midi, Chez Dumonet (formerly known as Restaurant Josephine, which many regulars still call the joint) has been operating since 1898, all under the ownership of the Dumonet family. Today, third-generation restaurateur Jean-Christian Dumonet helms the business and heads the kitchen. Chez Dumonet is nirvana for those seeking a quintessentially French meal that’s prepared in the old-fashioned style of bistro cooking, an approach that is becoming a rarity in modern Paris. But it’s not just the confit de canard that’s a spot-on bistro classic here: Patrons also rave over the made-tableside steak tartare, boeuf bourguignon, roasted lamb and the huge, order-at-the-beginning-of-the-meal Grand Marnier souffle for dessert. “Served with potatoes cooked in duck fat, which are appropriately showered with coarse salt while they’re cooking … It’s a dish that I would cross Paris to get to more often,” Lebovitz writes on his blog. The first is that the portions at Chez Dumonet are enormous in size, so much so that the restaurant offers “half-size” orders of many main plates—and even these are rather large. Unless you’re starving—or if you plan to skip appetizers, dessert or both—definitely opt for the smaller servings. Or combine two different half-orders to try more of the bistro’s classic French dishes. The second is that the prices at Chez Dumonet are rather high. Many main dishes are priced between €35 and €50, with half-orders coming in around €20. 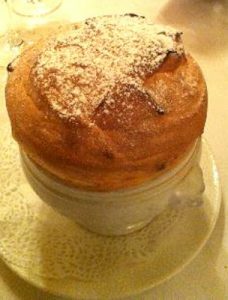 And the renowned dessert soufflé will set you back another €20. If you plan to eat a three-course meal, even with half-orders of your main dish, you should expect to pay €70 or more. Finally, while it is sometimes possible to simply pop in and get an open table, there are many nights where the bistro is fully booked. Lunchtime tables are typically more readily available, but even these can fill up quickly. As such, reservations are highly recommended. And though not exactly a warning, there is one very unusual quirk about Chez Dumonet: It’s closed both Saturday and Sundays, which seems odd given that weekends tend to be peak restaurant-going times. But given that the bistro is packed daily for lunch and dinner, apparently the owners are comfortable appealing to only a weekday clientele. 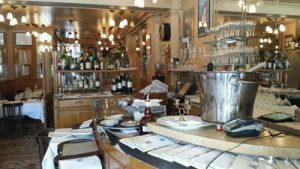 Chez Dumonet is located at 17 Rue du Cherche-Midi (Metro: Falguiere), and is open Monday-Friday from noon-2:30 p.m. for lunch, and 7:30-9:30 for dinner. Reservations and strongly recommended, and available only via telephone at 01.45.48.52.40. 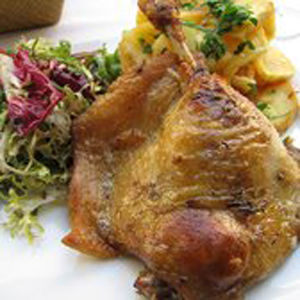 This entry was posted in Cafes and Bistros, Food, French cuisine, Left Bank, Restaurants and tagged Chez Dumonet, classic bistro cooking, confit de canard, Restaurant Josephine by Bob Adams. Bookmark the permalink.